The flavory character of new season Florida oranges and fresh cinnamon is well captured in this tea. 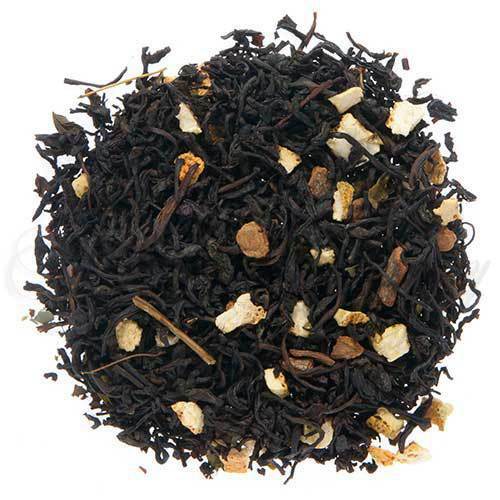 A truly tasty combination of Ceylon Tea scented with the natural oils of orange and cinnamon. Cup Characteristics: The flavory character of new season Florida oranges and fresh cinnamon is well captured in this tea. A truly tasty combination of Ceylon Tea scented with the natural oils of orange and cinnamon. Luxury Ingredients: Black tea, Cinnamon, Orange pieces, Lemon balm & Lime leaves, and Natural flavors. A very popular tea with a fragrant aroma accompanied by a light citrus taste of orange spice, which will warm up the coldest of winter nights or enhance an exotic sultry tropical evening. This tea also makes a warming morning energizer as well as an afternoon pick me up being tangy and vibrant. With ice this tea is a refreshing drink, with an exquisite combination of flavor and fragrance. This tea is definitely a special drink, which will rejuvenate your senses!